and Sneh Joshi (54yrs, riding Royal Enfield 350cc, Insurance agent). At various stages and in different ways we had met each other on rides and groups of riders who share a passion for motorcycles. Some of us have known each other for years while others had briefly met during one ride or another. Three of the women from the same group with some others had attempted to ride to the Mana pass earlier in the year during April but could not go beyond Mana village as it had snowed heavily and no permits were given. After securing permits, this group decided to attempt riding to the Mana pass again which led to this expedition. The closest settlement from Mana Pass is Mana, situated at a distance of 50 km. 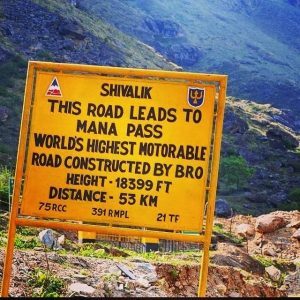 Mana village is just 3 km ahead from the iconic Badrinath Dham. Apart from rejoicing every bit of your successful bike tour, Mana Pass also provides eye-catching views of Chaukhamba, a mountain summit of Garhwal Himalayan Range. On the way, drivers can capture the beauty of Deotal Lake. Many difficult moments – to start with we were a very diverse team in terms of our riding experience. While a few of us had done many rides including rides in the mountains, for me it was the major ride ever! The first late evening/ night ride was the first test of our capabilities and strength as a team. Needless to say, on completion we had an immense sense of achievement and confidence that we could take on the rest of the ride. Riding in the treacherous terrain was a challenge for the body and more for the mind and every stage meant pushing the boundaries, acclimatising with the altitude. Major highlights:Visiting Neelang valley and Jhadung village which has been opened for citizens for the first time since 1962 debacle with China. As the terrain is rife with shooting stones and still does not support a safe motorcycle ride and the authorities do not give the permissions for motorcycles yet, we went there via jeeps and SUVs. The stretch of 53kms from Mana village to Mana pass is a steep climb and as per latest rules we were not allowed to carry cameras/ phones so unfortunately we could not take pictures or videos of the ride or the terrain. We stopped at this dhaba for a meal, to the amusement and amazement of the lovely ladies from Jaipur on the other table, who felt they were different from us professionals and motorcycle riders and very quickly over a small chat discovered that they had some things in common too…. We belonged to the same age group, were mothers and shared an excitement for life! Learnings:We had many learnings about ourselves what each one of us is capable of physically, emotionally and mentally. Our boundaries were often tested and pushed in many ways. In learning to navigate the treacherous terrain we learnt the power of the mind, the unconscious and the many ways in which our physical capabilities are limited by our minds. In tough times, as in tough terrains it helps to slow down, try new ways and persist. People are warm and affectionate mostly. If you reach out with love and authenticity, people reciprocate with warmth and affection. In addition to physical endurance, riding skills and mental agility, emotional intelligence is an absolute necessity for a trip of this kind. Was it difficult to do this kind of trip being a group of women? Did people react with hostility or were they supportive and helpful along the journey? At any point did you feel unsafe in that respect? What are some safety tips that you would highlight for a group of women on such a journey? We received a lot of love and support throughout the journey. The locals were extremely warm, affectionate and helpful. We did not feel unsafe at any stage of the trip. We were assisted with a support van throughout from the team of Where Eagles Dare. We would like to particularly highlight the support and help from ITBP (Indo-Tibetan Border Police) and Indian Army in the inner line area beyond Mana village up until Mana Pass. To see the forces in action in such extreme conditions merely reinforced our respect and affection for the brave soldiers. Any surprises:Each change in terrain was a surprise and whatever the experienced riders could say or show pictures could not prepare anyone for the final test. More than the surprises in the route, the plan or the terrain the biggest surprises were in the relating, the bonding amongst us and the many ways in which each one of us surprised ourselves with capabilities we never knew we had! The Himalayas are magnificent, attractive and compelling. We can’t wait to go back on another expedition, another adventure and explore new boundaries both out there and within. We come from diverse backgrounds and experiences with diverse personalities but share our passion for motorcycles and riding. We believe that there are many ways expressing ourselves, being a woman and riding motorcycles is one way of expressing our liberated minds. It is our way of saying “I believe, I am, I can… We can” . We hope that many women will be able to look at themselves beyond the social stereotypes and express themselves in the many ways that they are beautiful and significant. 39yrs, has been riding for over 25 years all over the Western Ghats, over strenuous terrains & High Mountain passes of Ladakh, Kashmir & Himachal, West Bengal and Sikkim. 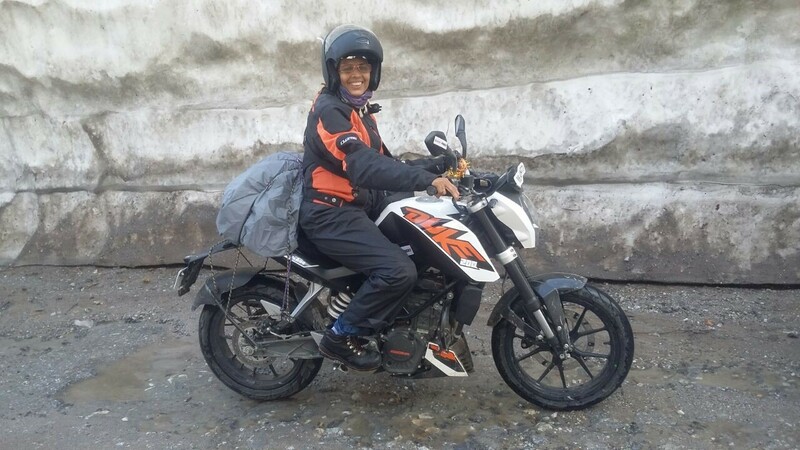 Having spent more than a decade riding in the Himalayas, she has been able to gain a lot of experience and knowledge about the natural forces, weather and routes, her successful attempt to ride up the Marsimek La, (highest mountain pass in the world) got recognition in The Limca Book of Records. Apart from riding up there in 2010, she has been riding to the gorges of Batalik, to the distant Turtuk (next to POK), Sasoma village (on the road to Siachen), to the mysterious fort of Hanle (farthest village near the Indo-China border) and has also done the scenic Lake circuit of Eastern Ladakh and has lead a group of 11 women riders up the world’s highest motorable road, the Khardung La, a feat which too, was recorded in the Limca Book of Records. Sheetal is also the first woman in India to have participated in one of the toughest rallies in the world, the Raid de Himalaya – Extreme. As a professional rider, Sheetal enjoys her work which includes travelling to places near and far as a Road Captain. 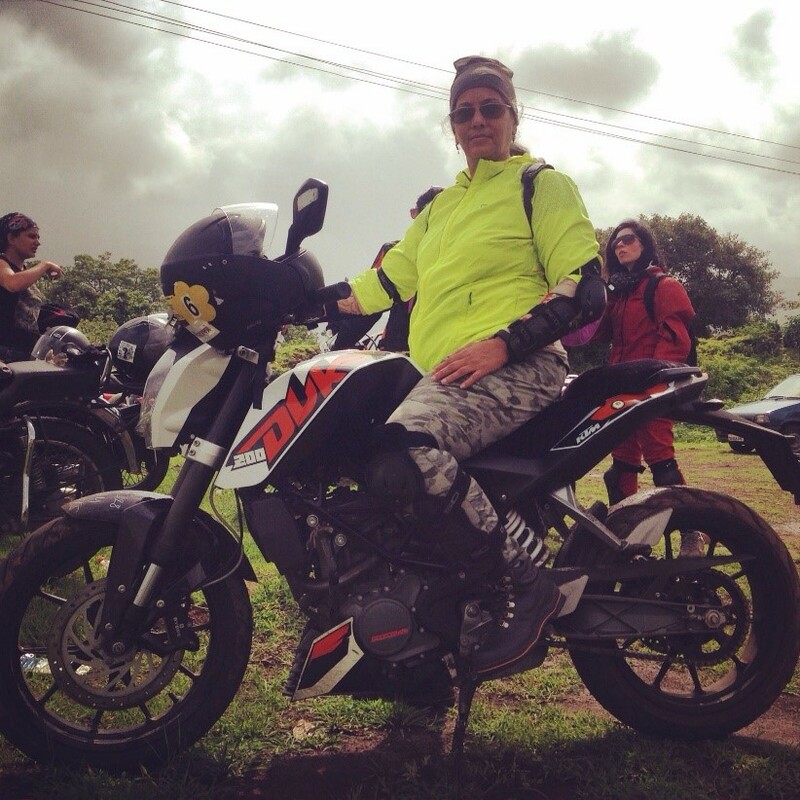 She organizes motorcycle and jeep safaris for enthusiasts willing to go on such adventures. Being a wonderful writer and a creative photographer, Sheetal enjoys writing travelogues and motorcycle reviews for magazines apart from articles on culture, food and cuisine and many other interesting features. 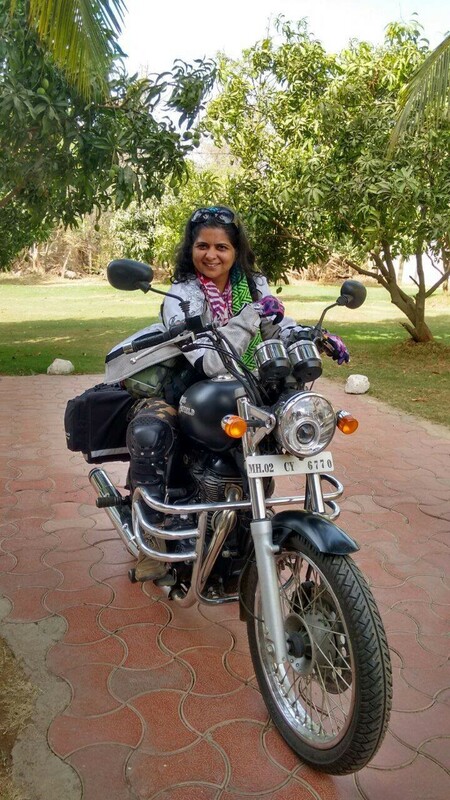 (PAST) As the Moderator and Board Member of The Bikerni (Association of Women Motorcyclists) and Chief of its Western Zone, Sheetal has been involved in promoting women on two-wheels and organizing rides, camps and events that empower women and hone their riding skills. “In simplest words, this ride means happiness to me. But to elaborate, it is a sense of homecoming – back to the Himalayas! Shalaka Zad is a well experienced rider who has been riding since 25 years in the Western Ghats. 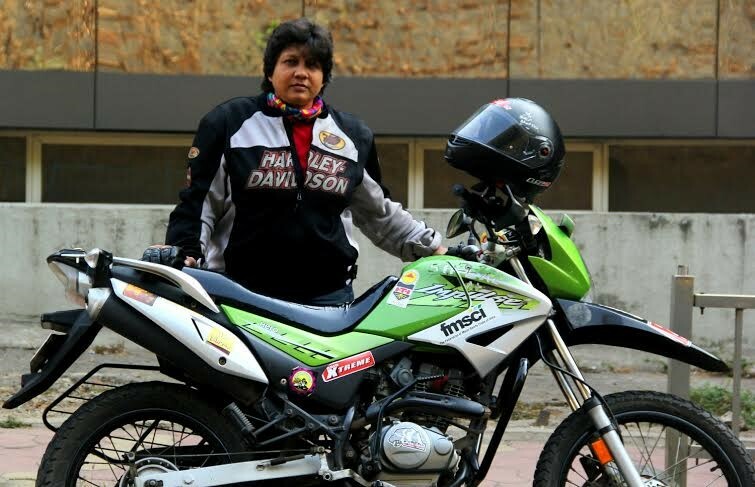 She is the first lady from Pune & Maharashtra to complete 1628kms in 24hrs. to become the proud recipient of SaddleSore Certificate . Her second attempt to complete the SaddleSore was as a pillion (with husband) fetched her yet another SaddleSore Certificate to complete 1630kms in 24 hrs, being the third couple in the country to do so. (PAST) Being one of the most influential members of the Bikerni, Shalaka had led the Maharashtra Times Rally, 2015. Shalaka is a member of Rotary Club of Pune Heritage and an Interior Designer by profession and has been running her own firm since last 10 years. She has also worked with JRVGTI, Pune as a Visiting Faculty and has also been on visits to MNVTI as a Motivational Speaker entrepreneurship. Shalaka had given coaching to Khushi Parmar to achieve her India Book record feat and has also been nominated as ‘Tour Rider’ for 9T9 Racing. 38yrs, is a true biker at heart. There has been no hurdle she hasn’t crossed. She has recently attempted the “Saddlesore” by riding 1600kms in less than 24hrs. Climbing heights and challenging the odds has been her elixir of life. 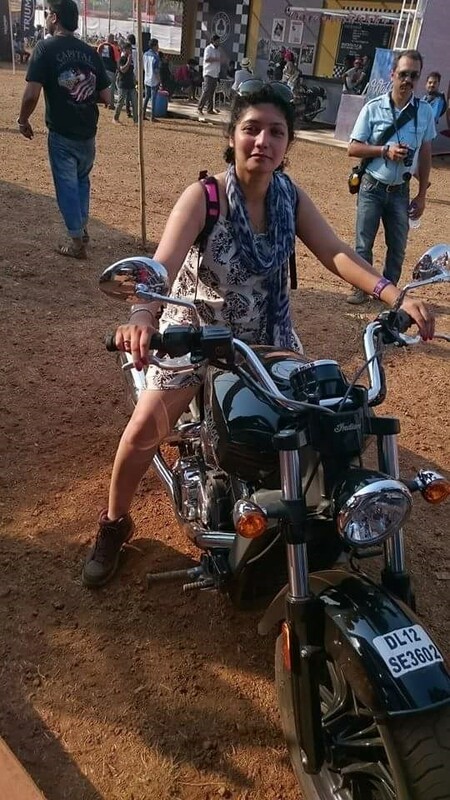 (PAST) A member of The Bikerni (Association of Women Motorcyclists), Shubhangi was chosen Admin of its Mumbai Chapter over a year ago and the association has only grown from then onwards. 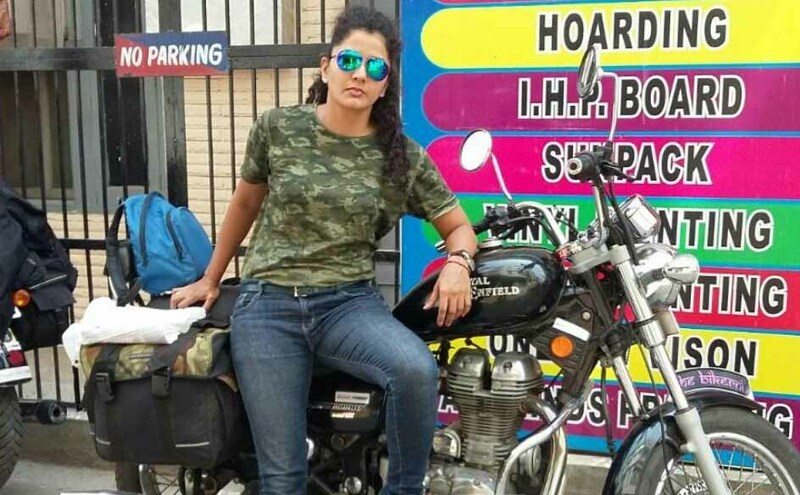 She has been riding her Royal Enfield Thunderbird 350cc motorcycle for three years in and around Maharashtra and south of India. Some of her long rides have been to Gujarat, Uttarakhand, Hampi and Dandeli apart from regular Mumbai – Goa – Mumbai rides. Shubhangi is a very creative Fashion Designer, a Kickboxing trainer, a foodie at heart yet a fitness freak! Its about getting close to nature, which indirectly means getting close to myself. Its not just a ride about bonding with friends… and knowing that with each other’s help, we can turn the impossible into possible! 38 yrs has covered 33,000 kms in her riding span of 3.5yrs. She rode her Royal Enfield Thunderbird 350 along the Spice Route in India for a span of 12 days visiting the southern part of the country. Her other long ride was to the Rann of Kutch in 2015. Kanchan has been on numerous rides in and around Maharashtra such as Daman, Dandeli, Goa, Shriwardhan, Diveagar and Bhandardara. Kanchan is a internationally certified Usability and UX consultant who specializes in designing Human-Computer interactions in various software services and products.She is a design strategist who designs software product lifecycle. After working with corporate in the past, she started her own consultancy named “Inspired Neurons”. A tranquil sacred place I have always wanted to ride to… It is going to be a total peace of mind…. 48yrs, is a rider who learnt on a 100cc motorcycle to commute in the city but was soon scaling the length and breadth of Maharashtra. Her first ride out of the state took her to Daman and Gujarat continuing onwards to the gorges of Dev Bhoomi in the state of Uttarakhand. A Fitness instructor by profession, Trupti runs a Fitness centre in Mumbai. This ride will be one of the milestones of my life! 54yrs, Sneh has been following her passion of riding since the year 1988. She loves riding her 350cc Royal Enfield Classic along the scenic western coast of India and the state’s many ‘ghats’. A fun loving person at heart, Sneh loves riding to Daman, Alibag and Goa while her most memorable ride was to Ladakh. Being an outright adventurous person, Sneh also engages herself in activities such as trekking and hiking while giving ample time to her career – she is a General Insurance Agent by profession! 41yrs, after many years she has revived her passion for riding over the last 2 years and rides a Royal Enfield Thunderbird 500cc. 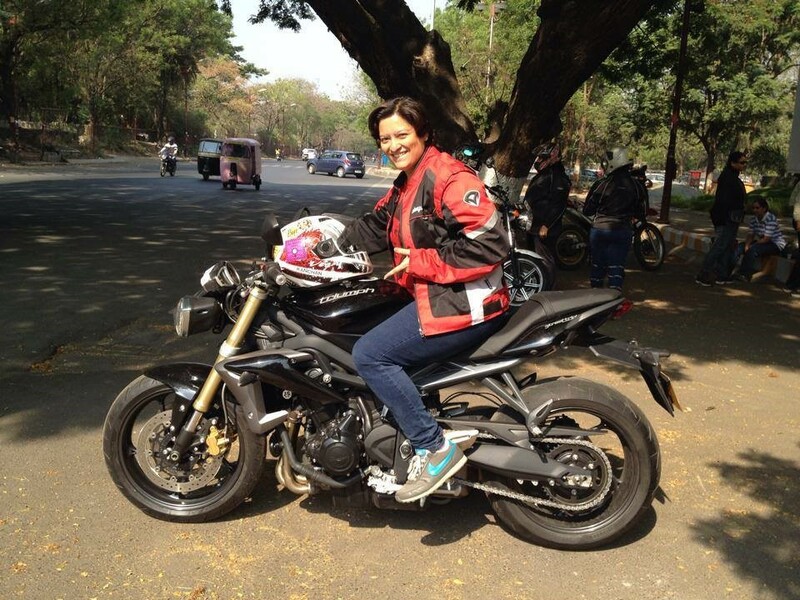 Her rides include rides to Lonavala, Western Ghats, Amby valley, IFRD to Daman. Following her MBA, she has been working in a variety of roles across industries until Sept 2011 when she set up her business consulting practice in the area of Organization Development & HR, through which she manifests her passion for people and belief in creating possibilities. She is a fellow of Sumedhas Academy for Human Context. She is a poet, a passionate feminist and has eclectic hobbies which include cooking, calligraphy, pottery and crochet. Riding to me symbolizes freedom, empowerment and self-belief. This ride with like-minded and passionate women has a special meaning in my life…. One of redefinition and new beginnings. I seem to have reclaimed a significant part of myself ever since I revived my riding, and with this ride I believe I will manifest these symbols for myself. Seven women, from diverse backgrounds and diverse personalities yet common in their passion for riding motorcycles and the belief that there are many ways of “being a woman” decided to undertake an expedition that meant creating new possibilities and pushing the boundaries of the body, mind and the what it means to be a woman. They decided to take their motorcycles to Mana pass, which is the highest motorable pass at 18399 ft above sea level. This expedition meant riding for 1200 kms over 10 days. The expedition travelled to Nelang Valley and Jhadung village which has been opened for the first time after the 1962 debacle. Then the seven riders rode all the way from Uttarkashi through the picturesque valleys to Tilwara, to arduous Badrinath and finally in the ultimate test of physical and mental strength to Mana Gaon which is the last village in the Indian territory. Beyond Mana gaon the team climbed up to the Mana pass with the able, warm and efficient support of Indo-Tibetan Border Police and the Indian Army, who were extremely hospitable and encouraging. Each day was a new learning in multiple ways of being a person, being a team, discovering one’s capabilities and pushing the boundaries of the mind and the body. Each climb on roads, and often on terrain that had no roads meant a new challenge and left the group with a sense of achievement, fun and mixed feelings of fear, anxiety, determination and joy. This is the first time ever that a group of women riders have attempted a ride to the Mana pass and have applied for the recognition by the Limca Book of Records. 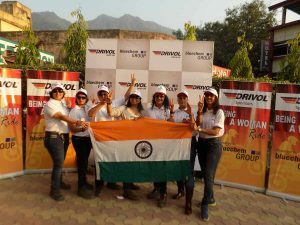 The seven women are Sheetal Bidaye (39yrs, riding Hero Impulse 150cc, professional rider), Kanchan K Tamhankar (38yrs, riding Thunderbird 350cc, Software design strategist), Trupti Sarmalkar (49yrs, riding KTM Duke200, fitness expert), Shubhangi Manjrekar (39, riding Thunderbird 350cc, advertising professional), Shalaka Zad (38yrs, riding Royal Enfield Classic 350cc, interior designer), Bhavana Issar (41yrs, riding Thunderbird 500cc, business consultant) and Sneh Joshi (54yrs, riding Royal Enfield 350cc, Insurance agent). The ride was organized and supported by The Vagabond, Where Eagles Dare and Sambhaavna group, who share the passion of creating possibilities and pushing the boundaries. The team from Where Eagles Dare provided the support and the platform for the team to spread the message, create awareness and realize this quest. DRIVOL sponsored “Being a Woman” Ride powered by The Bluechem group. DRIVOL is a leading German manufacturer, distributor and marketer of premium lubricating oils, greases and related services to automotive, industrial, marine, aviation, oil exploration and production customers across the world. It is headquartered in Frankfurt, Germany. DRIVOL has ensured that most of our Engine Oils we manufacture are SUPERKLEEN. The oils go through multiple layers of High quality filters to ensure minimum contamination! The Bluechem Group is the Worlds leader in High Technology Automotive Maintenance & Performance Enhancement solutions, based in Germany and are F1 Partner for the SAUBER TEAM. Wrangler Denims were the apparel partners for the riders and provided the team with their Motojackets, jeans and backpacks.